Located on the north side of the Village in the Six Mile Creek neighborhood at 500 Augusta Dr. It serves mainly as a children’s playground. Located in South Bridge Subdivision on the southeast corner in the beautiful Blue Ridge Addition at 1719 Daily Drive. This park includes a playground, basketball/tennis courts, open-air pavilion with picnic tables and a walking path. Located in south-central Waunakee at 1412 Tierney Drive. The land acquired through generous donations from the Eugenie Mayer Bolz & the Don & JoAnn Tierney families has been developed as a natural prairie. The 10 acre hilltop hosts a fabulous view of Lake Mendota and the State Capitol, as well as a walking path. Located at 900 S. Division St. on the west side of Sixmile Creek is managed primarily as a nature preserve and conservancy area, along with a walking path. Approximately 11 acres are upland and 36 acres are wetlands. Located at 901 South Holiday Dr., Centennial Park is home to the WaunaFest Celebration in July and is one of the most actively used park, providing baseball/softball fields, tennis courts, and children’s play facilities. Developed in the early 1970’s to serve Waunakee’s rapidly growing west side. The new pavilion was constructed in 2001. Located in Savannah Village subdivision at 1204 Hanover Trail, this park is surrounded by homes and provides a wonderful meeting space for neighbors and the community. The park includes an open-air picnic shelter, playground equipment, tennis & basketball courts, baseball/softball diamond and a sledding hill. Located at the corner of Hogan Road & Uniek Drive, open to the public during Village park hours. Includes mini pipe and quarter pipe, big box little box, square rail and big pipe rail. 2 parks in the new Kilkenny subdivision, off Peaceful Valley Pkwy, not yet fully developed. Nestled into a bend on Six Mile Creek at 105 Pleasant Dr., just behind the American Legion off Main St. This park has playground equipment and an open play area. One of the newest parks, located at 900 Kopp Road, at the west edge of Meadowbrook Subdivision. The park hosts two baseball/softball diamonds, playground equipment and a walking path. Future improvements include the construction of a tennis/basketball court. Located at 1211 Lawton Lane, Montondon Park is one of the main access points to the walking paths of the Arboretum that separates the two sides of the Savannah subdivision. An observation platform provides a resting spot for hikers and a spectacular view of the natural area. The Park, located at 400 Northridge Drive, has a youth baseball/softball diamond, playground equipment, tennis courts, and a walking path. A picnic shelter will be added in the near future. One of Waunakee's newest parks in the Kilkenny addition of Southbridge, this park is located at 2110 Peaceful Valley Parkway. This neighborhood park, located north of Prairie Elementary School at 100 North Madison Street, offers a wide variety of amenities, including play equipment, basketball/tennis courts, paved walkway, and an open play area, used for soccer & lacrosse. Reeve Park is located downtown at 100 East Main St., next to the railroad tracks and home to the Waunakee Area Chamber of Commerce. Also located during the summer months is Gram ‘N’ Gramps Popcorn Wagon. 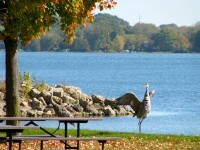 Ripp Park is the largest community park and natural area and is located at 301 Dorn Drive on the west side of Waunakee. The park is bordered on the west and north by wetlands and by neighborhoods on the south and east. Facilities include a multi-age soccer complex with 15 netted fields, 3 baseball/softball diamonds, 9 tennis courts, youth football field, 2 picnic pavilions with restrooms, 2 large children play areas, a sledding hill, walking trails and a pet exercise area. It’s also home to the Waunakee Relay for Life in June. Located at 1202 Arboretum Drive on the south end of the Savannah Village neighborhood. 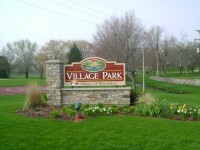 This neighborhood park offers a wide variety of amenities including playground equipment, basketball/tennis courts, roller hockey sport court, 2 sand volleyball courts, open-air pavilion, a paved walking path and an ice skating rink in the winter. Located at 400 Badger Lane in the Northridge subdivision. This neighborhood park hosts playground equipment, open play areas and landscaping. A gazebo and half-court basketball court are planned for the future. Located on the eastern edge of Waunakee at 5682 Hwy 19, working toward the goals of preservation, restoration and education, for more information call 608-849-4559 or visit their website at www.schumacherfarmpark.org. Find out more about Sponsorship for Schumacher Farm Events, CLICK HERE. Settler's Park is located in the Southbridge neighborhood at 1709 Blue Ridge Trail, the park is undeveloped with spectacular views of the Madison lakes and State Capital. Located on the far southeast corner in the Southbridge neighborhood at 1413 Tierney Dr. The park includes a shelter with restrooms, playground equipment, open play area for soccer & lacrosse, basketball/tennis courts, youth baseball/softball diamond and walking paths. Home to the Rotary Walk and located across from the Village Center, 333 S. Madison St. 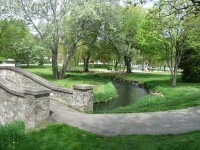 Located on the east end of Waunakee’s historic downtown at 400 East Main St., the Village Park is traversed by Six Mile Creek and is classically designed with historic stone bridges crossing over Six Mile Creek. The Parks recreational facilities include playground equipment as well as a Tot-Lot next to the main shelter, a youth ball diamond, basketball court, a gazebo, 2 restrooms and home to Murphy Field, a senior league baseball field. The Veteran’s Memorial is located at the Main St park entrance. Located on the corner at 417 East Verleen Ave., Water Tower park has recently upgraded playground equipment and also serves as a sledding hill in the winter. Located on the northwest corner in the new Westbridge subdivision at 1040 Kopp Road, it's the newest park of the Village Park system. A second park in the the Kilkenny addition of Southbridge is located at 2009 Foggy Mountain Pass. For more information on these Dane County Parks, contact the Town of Westport at 849-4372. Located in the Larwood Hills subdivision off CTH Q, Christina Park has playground equipment and grassy play areas. Governor Nelson State Park - 422 acres - (608) 831-3005 Located at 5140 Cty Hwy M, includes a 500 ft. sand beach, boat launch, picnic areas, 8.4 miles of hiking & cross country ski trails and scenic overlook of Lake Mendota. According to the takemefishing.org website, Governor Nelson State Park was rated #60 in 'The Top 100 Family-Friendly Places to Fish' in the nation in 2014! Located at the intersection of Hwys Q & M, 5130 Cty Hwy M, includes a 35 unit campground, beach area and shelters. Located at Riveredge and Rainbow Roads, Mary Lake Park has 2 basketball hoops, playground equipment and grassy play areas. Located adjacent to the Steeplechase Condominium Community, Steeplechase Park has a beautiful gazebo, playground equipment and grassy play areas. Located around the Town Hall and Kennedy Admin. Building at 5387 Mary Lake Rd. Includes the Daleo Soccer Complex, tennis courts, a ball diamond, playground equipment and open grass areas. Located south of Willow Rd. and the Westshire Senior Housing Community. Canoe launch, 250 ft of boardwalks, abundant wildlife and plant life. Located at the intersection off River Rd. on Catfish Ct. 20 acre pet exercise area, 3,000 ft. water frontage with canoe and kayak launch.